I finally finished and framed the cross stitch in time to give it to Ella before the Fishers fly to China on Wednesday. A couple of months ago, I was looking around for a small craft to complete (with the emphasis on small). 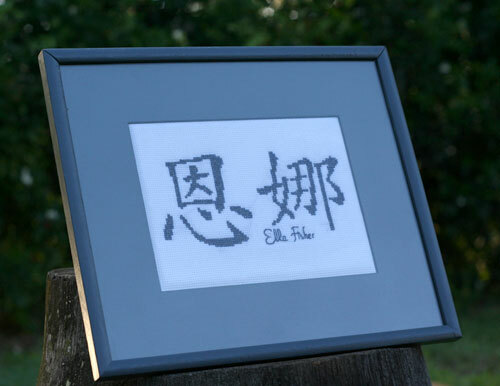 I know that if the craft takes too long, I’ll never finish it, so I was pleased to stumble upon this site where I could get any name translated into Chinese characters and then converted into a cross-stitch pattern. It was great fun to get back into the cross-stitch — it reminded me of the olden days in Berea with Aunt Aileen. I just found out this article and thank you very much again! its such a lovely present!